Restaurants add greatly to the holiday experience and Sydney is never short of eating establishments. Once, dining in Sydney usually meant heavy, albeit hearty, traditional English and French style cuisine. Now Sydney dining has a reputation that blends the freshest of foods with the tastes of the regions - Asian, pacific, tropical - with the more traditional European to produce a light, nutritious taste sensation. Some equate it with Californian style but others believe it to be a style unique to Australia. What really makes Sydney dining stand out is the diverse mix of cultures and ethnic origins that intermix in this city. The hot chillies from Indonesia and south-east Asia, curries from south Asia, coconuts from the Pacific, sushi from Japan, bamboo shoots from Vietnam and tomatoes from Italy all add tastes that form a truly unique dining experience. All the great cuisines of the world can be found in Sydney. If you know what you want, searching on terms like Sydney Italian restaurants makes it easy, but even more so when you use the suburb your in making your search more local to where you are staying. If you like seafood at all, make it a must do while in Australia. More Special Places to Eat: Sydney Australia Gourmet Experiences. Certain areas in Sydney have attained reputations for good dining. Darlinghurst, Kings Cross, The Rocks, Darling Harbour, Parramatta, City, Sydney Chinatown and Cabramatta just to name a few. The beach suburbs also have good choices in restaurants including Manly Beach, Cronulla Beach, Coogee Beach or even, yes, Bondi Beach. It is a long established tradition in Australia to bring your own (B.Y.O) wine. Restaurants here are classified either as B.Y.O. or licensed. You can purchase wines at hotel and pub bottle shops, or the liquor outlets in every suburb at very reasonable prices. Licensed restaurants normally have a select choice that you can enjoy, but at their prices. At the B.Y.O.’s, there is normally a corkage fee, but again, quite reasonable. Here are some suggestions for a great breakfast when in Sydney, with Good Food, Excellent Coffee and Atmosphere: Sydney Breakfast Places. Bush Tucker is now also very popular, with a growing number of restaurants who specialise in the exploring the taste sensations of traditional aboriginal foods such as seasonal fruits, nuts, roots, vegetables, meats and fish, served with other Australian creations such as Damper. All nationalities are represented when it comes to dining in Sydney. It is quite common to encounter streets where, side by side, there are restaurants providing cuisine from India, Singapore, Greece, Italy, Fiji, Vietnam, Lebanon, Thailand, Turkey, France, not forgetting the famous Scottish family restaurant - MacDonalds. But perhaps, above all, Sydney is famous for its seafood. Indeed, the Sydney Rock Oyster is famous around the world. So if your taste is towards seafood such as lobster, oysters, Balmain bugs, tuna or many other of the home grown delicacies, visit one of the many fine Sydney seafood restaurants. Chinatown, sandwiched between the entertainment areas of Darling Harbour and the city, is centred around Dixon St. It offers all kinds of Asian fare, not just Chinese, for lunch and dinner, you can even find Yum Cha for breakfast. Nasi Goreng, a traditional Indonesian fried rice dish makes for a delicious breakfast when topped with a couple of eggs. 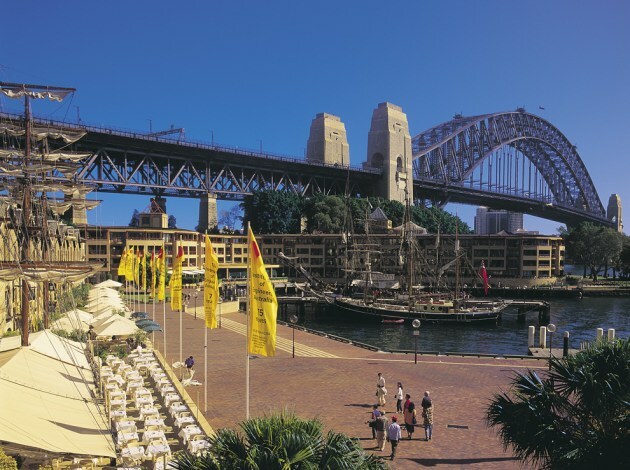 There are numerous lunch and Sydney Harbour dinner cruises available at Circular Quay. An excellent way to see the beautiful Sydney Harbour! See more about Sydney Harbour Cruises. Tips are appreciated for good service, but never required. Explore our many easy to get to beaches - Sydney Beaches. About finding employment and jobs in Sydney see Sydney Work - Jobs.